Located at the country’s central Pacific coast, the Conservation Area “Jiquilisco Bay – Bajo Lempa – Jaltepeque Estuary” was chosen as the target landscape for COMDEKS activities in El Salvador. This landscape is composed of a diverse mosaic of ecosystems, including agro-, coastal, marine, and terrestrial ecosystems, which also comprise natural forests. 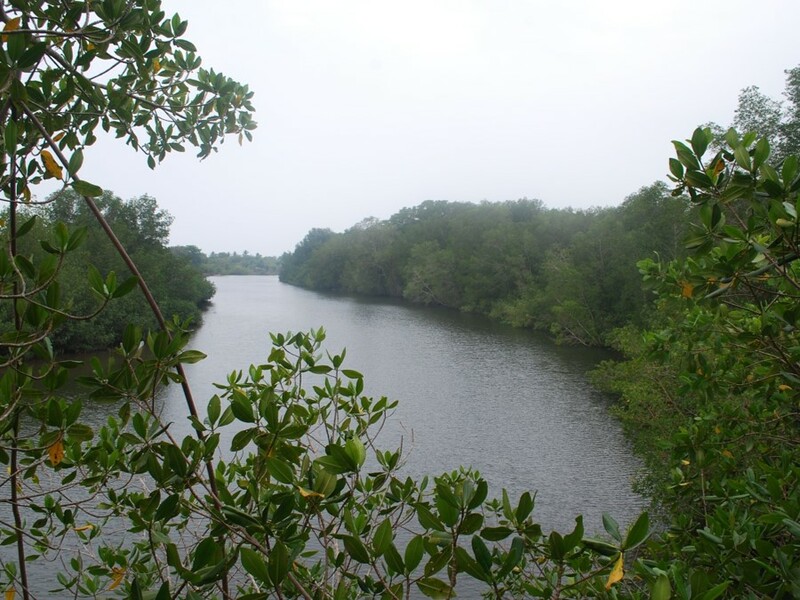 Land use ranges from the conservation and sustainable use of mangroves in the coastal area to the production of shrimp, coconut, sugarcane, livestock (on a small scale), fruit, basic grains, and vegetables in some of the wetlands. However, high levels of deforestation caused by fires, overgrazing of livestock and agricultural expansion, fuel wood and timber extraction, and illegal occupation of land have already resulted in the loss of significant forest and scrub habitats for local biodiversity. Additionally, the introduction of crops and tourist infrastructure causes loss of freshwater and mangrove forest. The Jiquilisco Bay and the Jaltepeque Estuary are among the country’s most important ecological corridors, together occupy an area of 112,454 hectares. Bajo Lempa is a coastal plain, in which the Jiboa and Lempa rivers are the major contributors to movement of sediment. Jiquilisco and Jaltepeque lie at the mouth of the Bajo Lempa delta flowing into the Pacific and comprise wetlands, coastal pain estuaries, intertidal mud and sand, sandy beaches, mangroves, seasonally saturated forests in Escuintla, Taura and Nancuchiname, as well as shallow marshes in and around El Aguaje. Exploitation of marine and coastal resources through inappropriate fishing practices of shellfish and Curileo has increased in recent years. Particularly harmful to aquatic biodiversity practices is the use of trawls. The local economy is based on productive activities that damage natural resources. Subsistence and livestock farming has expanded to lands not suitable for the use of coastal and marine resources. Reliance on these activities causes the overexploitation of resources, which affects the quantity, quality and hence market price of the harvested products, forcing the productive population to expand even further into new areas, including protected natural areas. Furthermore, soil and water contamination by the indiscriminate use of chemicals affect human health and the reproductive cycle of many marine coastal species. The Conservation Area Jiquilisco Bay – Bajo Lempa – Jaltepeque Estuary has a population of at least 25,000 inhabitants. Most local communities’ livelihoods depend on subsistence activities, since most people do not own the land but rent it year by year for the cultivation of basic grains or survive on coastal marine activities. The size of individual agricultural plots ranges from 0.2 ha to 2.8 ha, but some communities have established cooperatives to join plots into larger cultivation of sugar cane. The change in land use, traditional agriculture, the pressure on the mangrove ecosystem, and pollution of soil and water are some of the limitations that already affect the quality of life of communities in the area. During the rainy season, the area is affected by floods from overflow of the rivers Lempa and Jiboa, which degrade ecosystems, cause loss of riparian forests, and generally high deforestation in the area. Community members present a map of the target landscape prepared during the baseline assessment. In order to assess baseline conditions in the target landscape and identify opportunities for community action in a participatory manner, community consultations with 27 stakeholders were conducted in February 2014. Nine target communities were identified for the COMDEKS baseline assessment and five workshops with each 25 participants of local leaders and civil society groups were facilitated by the National Coordinator of the GEF Small Grants Programme, sharing the vision and approach of the Satoyama Initiative and outlining experiences and best practices from GEF SGP projects in the target landscape in recent years. Participants were able to identify and communicate increased pressures on natural resources affecting their livelihoods. Using the SEPL indicators, workshop participants evaluated local issues such as protection of ecosystems and preserving biodiversity; agricultural biodiversity; knowledge, learning and innovation; and social equity and infrastructure. Based on this assessment, workshop participants set priorities for COMDEKS interventions aiming to improve resilience of their socio-ecologic production landscape (SEPL). Improve the provision of ecosystem services in the landscapes defined by local actions for conservation and the sustainable use of natural resources. Improving agricultural productivity in the target landscape by promoting sustainable agricultural practices, which result in food security and income generation. Options for alternative livelihoods promoted within the landscape to allow access to markets and local financial institutions. Strengthen institutional capacities of local organizations, promoting the exchange of knowledge and information on the efficient use of natural resources and activities that develop the same level, which will allow participatory decision-making regarding actions in the landscape. The COMDEKS project aims to support community development, learning, and knowledge sharing by making small grants available to community organizations to help them maintain more resilient socio-ecological production landscapes. The types of community projects in the Jiquilisco Bay – Bajo Lempa – Jaltepeque Estuary Conservation Area that are supported by the COMDEKS programme include activities focusing on conservation and sustainable use of biodiversity in mangrove ecosystems, wetlands, estuaries, marine and freshwater bodies as well as integrated management plans thereof, and support alternative community-based subsistence activities to relieve pressure on conservation areas. Additionally, support is provided to projects promoting sustainable management of agroforestry systems through organic farming and conservation, including the introduction of different species of native seeds, green manure practices, and composting for organic fertilizer. Other types of projects might focus on implementing energy efficiency projects, promoting management and recycling of solid waste, facilitating community banks to establish and develop a collection of genetic plant resources for recovering traditional crops, and provide capacity building and technical assistance to train leaders for sustainable environmental management, among others. The COMDEKS Country Programme Landscape Strategy for El Salvador can be downloaded here.